So glad you're here! We'd like to share a bit about ourselves. We attend the Coopersville Campus of All Shores Wesleyan. After Jon's first trip to Africa in 1999 for a construction project, he knew a part of his heart stayed behind. We continued with various mission trips and projects to Africa until 2009 when we took the step to live in Nigeria for a year with our youngest son. As our work continued to develop and grow, we decided to form a nonprofit / 501c3 charity. In 2012 we launched an outreach project named It's Our Mission: Period! You can read more about this outreach at this website. 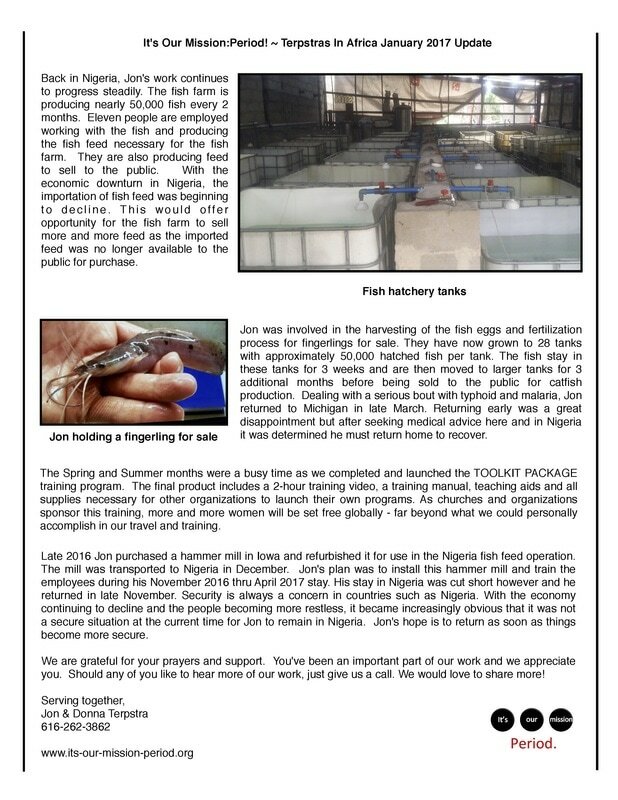 To read our latest update, click on either of the images below and it will enlarge for ease of reading. ​To hear more about our work, please feel free to contact us!